Josh and Melissa get locked in the fridge at Lassiter's. Josh presses the emergency alarm, but the kitchen hand has gone home and the kitchen is in darkness. He worries that they'll have hypothermia by morning. 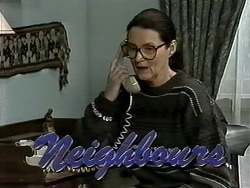 Doug is trying to ring Todd's mum in Adelaide looking for Cody, but she's not in. Pam says that if Cody is on her way there, at least she'll be safe on a bus. Doug says they'd better ring the police in the morning. Helen and Paul arrive back. Todd greets Helen, but she already knows what's been going on - Paul fills her in. Helen says that Todd should be ashamed for worrying them all so much. 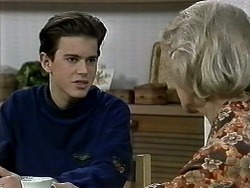 He says he didn't know what else to do - he wants to live in Erinsborough. He begs her to talk to his mother on his behalf. Helen says she'll have to think about it. When Todd has gone to bed, Helen tells Paul that she can't ignore Annette's feelings. Ryan is up late watching TV when Dorothy comes in from dinner. 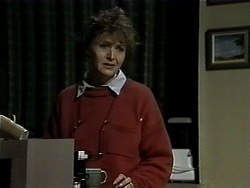 She's had a row with Winnie because she arranged a date for Dorothy with one of her old boyfriends - and he was horrible! Ryan says that Dorothy should find her own man, but says she's perfectly happy on her own - well, most of the time. But actually, she does have two tickets for the Archeology Ball that she needs to take someone too. Josh is trying to stop the fridge fan and succeeds - at least the cold air won't be circulated. Melissa says she's scared - if she doesn't get her epilepsy medicine by morning she might have a seizure. Josh reassures her and starts ripping up cardboard boxes to stuff down their clothes as insulations. Then he makes a sort of igloo out of a cardboard box. Melissa starts to cry and Josh assures her that he'll get them through this. JOSH: I'm not going to let anything happen to you. Ever. Josh and Melissa are cuddled up together. Melissa feels so tired but Josh won't let her sleep. He gets her up and tells her that they have to keep their circulation going. He makes her play I-Spy to keep her going. Finally, they hear someone outside. Josh bangs on the door and a woman opens it. They stumble out of the fridge. Ryan tells Dorothy that he's found a good man for her in the personal section! Dorothy says she's not looking for a husband - just someone to go with her to a dinner party. Ryan suggests she puts her own advertisement in, but she isn't keen. 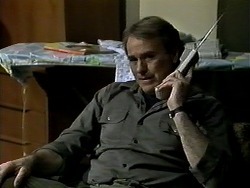 Ryan suggests taking Jim, but Dorothy doesn't think he's her type. Maybe there's someone at school - like Mr Denning. Ryan is horrified and says he's much younger than Dorothy! But Dorothy decides she'll ask him anyway. Pam and Doug are worried sick about Cody. There's a knock at the door and Doug answers it, but there's no-one there. He does see Josh running off down the street though. There's a letter on the doorstep. Doug goes in and opens the letter, which is from Cody. It explains that she's gone to Adelaide to see Todd. Pam starts to cry and Doug says they'd better phone the police - at least they know where Cody is. Todd is telling Helen that it's not just about Cody - he's having trouble living with his mother - they can't seem to connect. Helen says it's only natural because they've been apart for so long. Todd feels she treats him like a little kid - and also she only wants him in Adelaide because she thinks it's the done thing. TODD: My family isn't in Adelaide anymore, it's here and I don't understand why you want to make to make me go and live where I don't belong. HELEN: Noone wants that. We just want what's best for you. She advises him to spend more time with his mother, and with Katie too. As they're talking, Paul stomps in and asks if Helen has Josh and Melissa's phone numbers - they're in serious trouble and he needs to talk to their parents. Josh is telling Ryan about the fridge incident - Melissa is at home under an electric blanket. He thinks they got away with it though - they sneaked in before their parents were awake. Ryan tells Josh about Dorothy's dinner dance and her inviting Mr Denning! Josh suggests a dating service, but Ryan doesn't think Dorothy will do it. Helen tells Todd that has decided to talk to Annette about him staying in Erinsborough, but if his mother wants him back in Adelaide, he'll have to go. 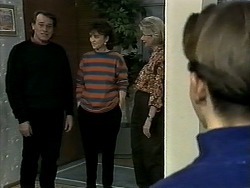 Doug and Pam come around to tell them that the police have picked Cody up at the bus depot in Adelaide. Todd's mother still isn't answering the phone. Paul has dragged Melissa and Josh round to his house. He's beside himself with rage and tells them that they've caused a lot of expensive damage to the fridge. JOSH: We were trying to warm the place up! What did you want us to do, freeze to death? PAUL: No, of course not! But you shouldn't have been there in the first place, should you?! He reckons they or their parents will have to pay for the damage. Melissa finally pipes up and tells Paul that they've proved that he hasn't changed his tuna supplied. Paul looks guilty and Melissa says she's going to go to the Erinsborough News. Josh tells Paul not to threaten them - they won't give up their fight. Helen is just ending her conversation with Annette. She's agreed that Todd can stay on in Erinsborough. Doug isn't pleased and tells Todd that he's a bad influence on Cody. DOUG: Neither of you will go unpunished. When Cody comes back you're going to see very little of her. She's grounded - indefinitely. Ryan comes in and asks Dorothy about personal adverts again. She says they're not really her cup of tea. Ryan asks about computer dating and would Dorothy try that? He's picked her up a brochure for "Elite Introductions". He encourages Dorothy to try them out. Dorothy says she's already decided not to ask Mr Denning if that's what Ryan's worried about. When Ryan has gone, Dorothy picks up the brochure and reads it with interest. She goes to the phone and dials their contact number!